Modern Kebab House uses their own specialised couriers to deliver their food. 3 skewers of chicken meat with salad rice or bread. 3 skewers of lamb back strap with salad and rice or bread. 3 skewers of lamb mince with salad and rice or bread. 3 Skewers of lamb, lamb mince and chicken with salad and rice or bread. Half chicken with chips, bread or rice. Whole charcoal chicken served with chips, salad and sauce. 4 pieces of drumstick with chips and sauce. Afghan traditional dish fried lamb and rice with bread and salad (everyday). Fried eggplants and tomato with bread and garlic yogurt (everyday). Fried rice and lamb dices with bread, salad and sauce. Spice meat mixture in a dough wrapper. Pieces of chicken slowly cooked with rice. Flavoured with fresh mint, coriander leaves and saffron. Tomato sauce, fresh tomato and cheese. Tomato Sauce and lots of cheese. Tomato sauce, striped beef, salami and beef. Tomato sauce, salami, and cheese. Tomato sauce, salami and cheese. Tomato sauce, mushroom, capsicum, onion, pineapple, cheese and olives. Tomato sauce, tandoori chicken, onion, capsicum, mushroom, pineapple and olives. Tomato sauce, tandoori chicken, pineapple and cheese. Tomato sauce, tandoori chicken, mushroom, onion, cheese and BBQ sauce. Tandoori chicken, mushroom, tomato and ranch sauce. Tomato sauce, striped beef, mushroom, onion, capsicum, pineapple, salami, cheese and olives. Tomato sauce, tandoori chicken, mushroom, capsicum, onion, pineapple, cheese and olives. 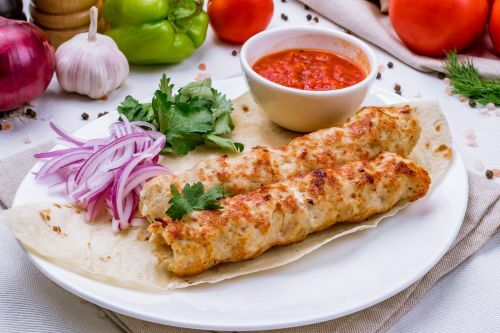 One skewers of any kebabs with salad and sauce. 2 Skewers with salad, sauce and bread. Thin crust stuffed with vegetables.